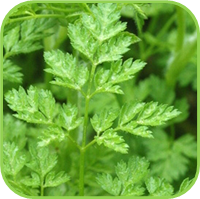 Also known as French Parsley. •±60 cm; Spread: ±30 cm. • Full sun to semi-shade; Well drained, composted soil. • Pick fresh leaves throughout the year. • French dishes. 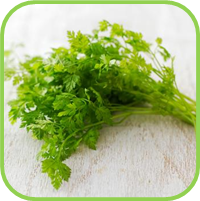 It is an essential ingredient of ravigote sauces and fines herbes . 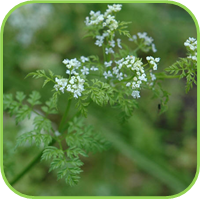 • The delicate anise flavour does not withstand drying or prolonged cooking; chervil is therefore usually added just before serving. • Eat raw for additional vitamin C, carotene, iron and magnesium. • Curried Vegetables with Rice and Feta. • Use in an infusion or face mask to cleanse skin, maintain suppleness and discourage wrinkles. • Topical for conjunctivitis, inflamed eyelids. • Alleviate chronic catarrh, Expectorant. • One cup, three times per day.